Another one. I know, I know. I may have a teensy problem with casting on new sweaters before the old ones are finished. In this case, though, I blame the Tour de France Time Trial. 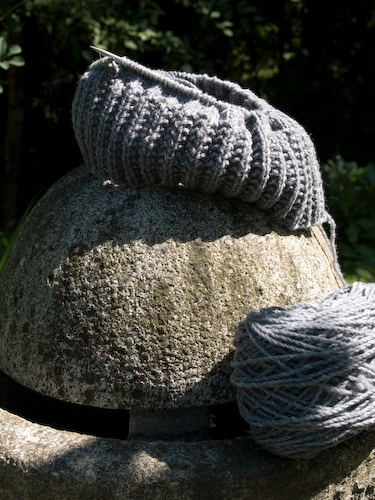 Have you ever tried to knit linen really fast for a solid hour? A person could incur lasting tendon damage, I think. My knitalong team turned in the lowest stitch-per-hour average in the first trial, so I was determined to help us improve. And how better than straight-up stockinet in the round with spring, squishy Beaverslide merino? I warmed up by working the mistake-rib hem you see here, and this morning I was ready to crank on the stockinet body. My neighbor Barb gave me the French-style countdown (one counts ones fingers in a different way than Americans normally would when sending off a rider in the Tour de France, or a knitter in the Tour de France KAL) and I’m happy to report I achieved 2,024 sph. But I’m putting this sweater aside again to (gasp) finish some other things, so I’ll introduce her properly later on. Tomorrow is for finishing Daisy Daisy, and then there’s last-minute Baby Shower knitting to be done!